Wal-Mart is the largest public corporation in the world, the largest retail company in the world and the largest employer in the world with over 2 million employees. We all know Wal-Mart. Ninety-seven percent of Americans visit Wal-Mart at least once a year; while thousands organize against Wal-Mart expansion. What more is there to say? For marketers, there is a great deal more to say. We are all aware of the power of disruptive technology to overturn old industries and generate new industries. The auto displaced the horse and buggy; the railroad displaced long distance carriage driving; the telegraph replaced the pony express; the telephone reduced letters; and ad infinitum with radio, airlines, television; computers and so on. But only scholars and business executives know about disruptive business models that replace old ways of making, selling and buying things with new ways of operating. Wal-Mart is the first exposure of a controversial disruptive business model. Few people know what, why and how this happened. Wal-Mart shoppers don’t have a clue. Scholars and mangers are just beginning to understand the disruptive Wal-Mart model burrowing under its wall of secrecy. I hope to shed a little light on this dark matter. Charles Fishman wrote a brilliant journalistic account in 2006 called the Wal-Mart Effect. It was a best seller because fans and foes did not know what made this company tick. It is now 2014 and Wal-Mart’s size and impact has grown even more colossal and not much more is known about how Mal-Mart really works. Let’s get to data and see if we can discern at least part of its secret. Wal-Mart opened its first store on July 2, 1962 in Rogers, Arkansas, a town of 5,700 people near its headquarters in Bentonville, Arkansas. Sam Walton, a former army captain with a business degree had a small chain of five and dime stores in Arkansas. From this inauspicious beginning, Wal-Mart has grown by 2014 to 3,273 Wal-Mart Supercenters in the United States, along with 510 discount Stores, 330 Neighborhood Markets and 630 Sam’s Clubs. Wal-Mart’s international operations comprise additional stores in 26 countries. For the fiscal year 2011, Wal-Mart reported sales revenue of $466 billion, a net income $15.4 billion, and a 24.7 percent gross profit margin. The company’s international operations accounted for $109.2 billion, or 26.1 percent of total sales. Today, Wal-Mart accounts for 55 percent of U.S. grocery sales and 10 percent of all non-automotive retail sales in the U.S. It exceeds the combined sales of its four closest competitors. To bring this colossus into human perspective, the total amount spent at Wal-Mart every hour of every day is $36,000,000. Nearly every American lives with 15 miles of a Wal-Mart and most within five miles. This will narrow further as Wal-Mart builds up is Neighborhoods Markets and Express Markets in every American city and expands its ecommerce channel. The same course of spatial ubiquity is happening in its international operations, but it will take time to reach the intensity of its American presence to every foreigner’s. Wal-Mart is the largest retailer in Mexico, Canada and several other countries; and there is no let up on Wal-Mart’s drive toward pervasive presence to global consumers. As a merchant in poor rural areas of Arkansas, Sam Walton had a brilliant insight. He understood the paramount importance of price for his low income shoppers who struggled to pay extra pennies for brand goods. He knew the power of brands to get a premium price; but he also knew that the price pressure on these families was too great for their budget. He tried as hard as he could to find lower price brand options, always mindful that brands mean quality to customers. They needed quality goods at a lower price. He was devoted to solve this consumer paradox of price and quality and searched ceaselessly for brand goods of decent quality at the lowest possible cost to him so he could pass on his cost savings for a lower price of goods to his customers. He succeeded and his customers responded positively to his resolute devotion to meeting their price constraints. One store led to another and volume increased. This volume growth enabled him to bargain for his brand supplies at a lower cost. With greater supply cost discounts, he was able to keep his prices to customers steady. Here we come to his strategic insight and brand commitment. Strategically, he sought greater volume for greater supplier discounts. This could keep his low prices stable. Fortunately, Sam only had a business degree, not an MBA. Had he gone further, he would have heard the conventional formula of marketing, namely that brands carry a premium price and yield a higher profit margin to the seller than “commodity” goods, and more profit to pass on to shareholders. Since Wal-Mart was a family business, shareholder return did not press upon him. Instead of pocketing brand profit, he could pass his costs savings into capital expansion for ever greater volume and ever greater supplier discounts. He could keep his low prices steady; and even at a critical point of volume growth beat all of his competitors with the lowest price in any geographical area. Wal-Mart shopped for lower cost quality suppliers and found lesser brands that met customer perceived quality minimums. He was too small yet to offer still lower priced store brand goods that could piggyback of quality premium of his company mark. That would come in time, when customers finally trusted Wal-Mart as the lowest price shopping destination. The positive response of his customers to Wal-Mart’s pricing strategy drove him to open more stores across rural and metro areas and consistently follow his paradigm of high volume sales for lowest supplier cost and lowest price to customers. Volume would overcome low unit profit margins. Profit from volume growth at low unit margins would be his profit surrogate for quality brand premiums. 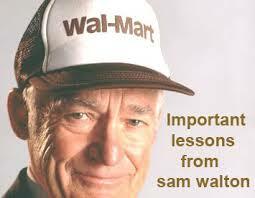 Now we move to the moral dimension of Sam Walton’s strategy. He would not build his fortune on the premium value of brand goods; but rather drive his entire business to one compelling objective: quality at lowest price to the customers. His fortune would come with volume, not premium price. The high volume of tiny margins to shoppers would be the key to his kingdom. Wal-Mart built larger stores with more merchandise categories in more places for ever more volume and ever greater supplier discounts. He built enormous 260,000 square foot Supercenters, Wal-Mart Discount stores, averaging 102,000 square feet, Wal-Mart markets averaging 42,000 square, and smaller Neighborhood Markets and Wal-Mart Express kiosks. As his stores grew bigger and more numerous, he grew his customer base on two grounds, – lowest price to customers and greater shopping convenience. Wal-Mart overturned the conventional brand equation of price as a function of the measure of perceived quality over the quality of standard goods. In conventional branding, price is a dependent variable. For Wal-Mart, price became the independent variable. Cost of goods and quality had to be manipulated to secure the ever lower price to customers. Wal-Mart moved agilely into its own store brands, when and where it could not squeeze brand manufacturers any further; and added its own channel brand quality to the mix to compensate for any derogation of product brand quality. How did Wal-Mart accomplish this reversal? Wal-Mart buyers went to the brands and said we will give you your premium value in volume, not price. 100,000 units of a $1.20 item for 95 cents each would be worth more to your brand, namely $95,000, than 50,000 units purchased from you at $1.00, namely $50,000. This made sense to suppliers, so they discounted…and discounted until hundred of suppliers went bankrupt after expanding their capacity to meet Wal-Mart’s enormous volume orders, until they could no longer say yes to more discount. Wal-Mart cut them off by the knees for a lower cost supplier. Many suppliers folded and a lot of manufacturers went to Asia to reduce supplier cost. America lost a lot of manufacturing jobs, customers were happy with low prices, inflation was abated and competitors were vanquished. What was Sam to do with his discounted savings of five cents on an order of 100,000 units, or $5,000? Conventional business would say “pocket” it as profit. But that was not Sam’s commitment. He would divide the $5,000 into three parts: 1/3 to price reduction; 1/3 for operations; and 1/3 for company profit. One third of $5,000 is $1,666. Divide this by 100,000 units, and you can reduce the price to customers by 16 cents, and sell it for $1,04 per item instead of $1.20 – a bargain surprise on pallets! This left Wal-Mart with an extra $1,666 toward operations and an extra $1,666 toward company profit. Sixteen cents savings to shoppers on a $1.20 item may not seem much of a discount, but if the discounted is added to a basket of other reduced prices, consumers save not pennies, but dollars. Over the course of the year, they save hundreds of dollars. There was another way to cost his costs, beyond supplier volume discounts. If he could also reduce his operations costs, then he had a double whammy for lowest price to customers. Forthwith, the legendary Spartan modesty of headquarters in Bentonville and regional offices; the lower salaries to managers in exchange for stock options; and low wages to non-unionized store employees; but never below minimum wage. Many of his early managers became shareholder millionaires at their retirement and many store “associates” became managers. The second third of his extra supplier discount of $5,000 went to capital expansion and operational efficiency….more stores for more volume and steeper supplier discounts; more distributions centers for lower logistics cost; better management for store motivation and sales; and better information systems to reduce overstocking and insure that the shelves were filled with what was needed. The combination of high volume for supplier discounts and low and efficient operations enabled Wal-Mart to sustain the brand of everyday lowest price to consumers. The final third of his $500 supplier costs saving went shareholders, top management and personal fortune. A lot of political rancor has grown to stop Wal-Mart. Unions, independent retailers and liberal citizens have organized politically to block every new Wal-Mart development. They have generally failed because consumers want low prices and they vote. The mistake of opponents has been to attack Wal-Mart for its low wages. Wal-Mart has always kept to the minimum wage. Their greatest damage has been delivered to small business retailers and to suppliers who were enticed to provide volume beyond their financial and commercial ability to sustain capital investment in greater capacity, when Wal-Mart finally said “good-bye”. Initially these suppliers cut domestic corners and moved plant to lower cost regions in the U.S. Then they took their manufactures off-shore for lower costs. Many finally failed on foreign soil as local suppliers emerged to meet Wal-Mart’s requirements. America has lost hundreds of thousands of small retailers in proximity to Wal-Mart; thousands of supply manufactures; and millions of U.S jobs, all in service to the brand mission of lowest price to consumers. Competitors like Target, Whole Foods, Macys and others have managed to survive in higher income areas that Wal-Mart has not yet invaded. But Wal-Mart is coming into urban America and we will see what happens! We have yet to see what will happen to Amazon as Wal-Mart moves more forcefully into ecommerce. In a paradoxical manner, Wal-Mart is the dark shadow of Marketing. The universe of marketing has always been value creation for the consumer. The predicate of our science has always been a fair exchange price to sellers for offered value to customers. What happens to marketing when value to the consumers subverts value to many producers and retailers? Classical marketing in a world of local boundaries did not foresee how modern distribution could break this equation. Global Wal-Mart has done this with universal volume at infinitesimal margins. The consumer is victorious over severe consequences to the national economy. A new balance must be found. So far Wal-Mart cannot be stopped because it is fundamentally popular with voters. It is the greatest friend to the masses, now called consumers, as they struggle to make their ends meet. Political leadership must address this issue and find a solution; and marketing science must contribute to this solution. I just returned from China and was elated by everyone’s use of WeChat’s mobile closed, personal contact-focused network: part messaging service, part social network. WeChat provides instantaneous multimedia communication with text messaging, hold-to-talk voice messaging, broadcast (one-to-many) messaging, photo/video sharing, location sharing, and contact information exchange. It supports social networking via shared streaming content feeds and location-based social plug-ins to chat with and connect with local and International users in over a dozen languages. 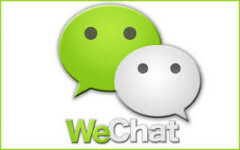 WeChat was launched by Tencent in 2011. As of February, 2014 CNN reported that WeChat had nearly 300 million users, out of Tencent’s base of 800 million users. WeChat users call for taxis and pay for rides by swiping their bar codes. 21 million taxi rides have already been booked by WeChat. This is far ahead of any U.S. mobile platform and I have it installed WeChat’s App on my U.S. iPhone, and am encouraging my U.S. friends to do the same. My friends in China were eagerly anticipating WeChat’s forthcoming virtual credit card service and online shopping features with TenPay’s financial transaction program. Virtual credit cards for ecommerce have just started their trial run in China on Tabao and other eShoping platforms. According to the WSJ, Lai Zhiming, the manager of Tencent’s third-party payment platform TenPay, said that the company would add payment services to WeChat. TenPay, like eBay Inc.’s PayPal in the U.S., will allow users to swiping barcode-like QR symbols, which can be used for buying everything from cinema tickets to beer. TenPay will process online payments directly from shopper’s personal accounts. This will give WeChat a revenue flow from online and in-store purchases and eventually encourage retailers, restaurants and other stores to advertise on the platform. WeChat is competing with Alibaba’s Tabao for a massive thrust into online marketing. What cheered me about Chinese enthusiasm for WeChat, as well as for Allibaba’s Tabao online shopping program, was the power of mobile smart phones to expand Chinese consumption and meet government goals for a growing consumer economy to offset a declining export economy. To my dismay, I learned from the Financial Times on March 15 that “China has ordered a halt to mobile phone payment systems and virtual credit cards, in a move that will slow the rapid development of online finance in the country.”The People’s Bank of China (Central Bank) suspended mobile phone payments for the purported reason of ng consumer protection. The announcement was for temporary suspension, but who knows how long this will last. The most powerful agent of consumption growth has been halted by vested interests. Changing China’s slack consumer business model based on debit cards to turbo charged mobile consumerism is no easy matter. The banks are seeing an outflow of deposits to fund these virtual cards, which are paying a higher interest rate than the banks. UnionPay, the State-owned credit and debit card service is losing debit card transaction fees. State-owned financial institutions, long protected from competition by a cocoon of government regulation, have been shaken up over the past year by increasingly aggressive internet companies. Alibaba and Tencent have led the charge with online savings funds that in effect function like bank accounts and with mobile payment systems that have started to displace debit cards. Chinese officials have so far permitted this incursion on the banks’ turf, but now the Central Bank has put the brakes on virtual credit cards before they have had a chance to do major damage to established interests. This is a good instance of how private sector disruptive technology threatens State-owned sector practices; and how established government interests fight the stop new private sector technology that adversely impacts State-owned enterprises. If UnionPay were a competitive private sector company, it may have gotten ahead of the curve and partnered with Alibaba and Tencent. The government suspension of virtual credit cards, hopefully only temporary, will have major consequences on consumption growth. According to Bloomberg, Chinese shoppers in 2013 spent 1.3 trillion Yuan ($213 billion) online, just slightly less than the $225 billion tally in the U.S. The Chinese online retailing market has grown at a scorching 71 percent compound annual growth rate since 2009, about five times as fast as its American counterpart, according to a report by Bain & Co. If this trend holds, China will become the world’s No. 1 ecommerce market. By 2015, Bain sees the Chinese market reaching $541 billion. The suspension of mobile payment has a heightened impact on the rate on online retail growth. Mobile payment is the dynamic force of online shopping growth. Mobile ecommerce is far outpacing desk top growth in online shopping. The current norm of mobile shopping is 15% of total online retail. Growing from virtually zero in 2011, it is likely that mobile shopping will reach 50% of online sales in a few years. The major reason for mobile ecommerce growth is that China is already the largest smart phone market in the world. Mobile subscribers in China are now using 330 million smart phones—which is a 150% increase over 2011. According to CNNMoney, China’s active smart phone market in 2013 now exceeds the total number of all 321 million mobile phone active in the U.S. Kai-fu Lee, the former lead China researcher at Microsoft (MSFT) and then Google (GOOG), predicts that China will have 500 million smart phone in use by the end of 2013. Enough of data! Let’s get to the point of China’s domestic consumption growth policy. Housing has been the conventional marketing driver of consumption over the past two decades, as families shopped in stores for appliances and accessories to outfit their new homes. But housing sales are flagging, in spite of the government urbanization policy. Furnishing new condos by in-store purchase or even desktop online purchase will not do the trick. The future of China’s consumption does not only lie with home furnishing and accessories. It lies with the discretionary personal life style purchases of high income young people and adult professionals who have the wealth to spend on life style experience, – consumer electronics, apparel, dinning, personal care products and service, travel, books, games and a host of experience products and services, instead of just furnishing an apartment. On May 19, 2014 the U.S. Justice Department indicted 5 alleged PLA Chinese cyber-attackers in Shanghai for corporate espionage. On May 21, the Chinese government condemned these charges. On May 25,and announced through a variety of public statements that it would mandate restrictions on State-owned Enterprises procuring U.S. consulting services, referencing McKinsey, Cisco, Bain, Boston Consulting Group, IBM and other major U.S. multinational consulting firms. The initial impression is that the restrictions would be limited to digitally delivered services, but it might extend to other services, as well. This declaration followed an earlier prohibition on government agency procurement of Microsoft’s Windows 8 platform and limits of purchases of Cisco and IBM servers and software by government agencies and State owned companies. No procedures have been specified for implementing this declaration, but they will be forthcoming as formal protocols or, more likely as ad hoc limits, threats and delays. The major beneficiaries of these announcements are the Chinese digital players, like Huawei, ZTE, Inspur and other domestic IT firms. According to the New York Timers, Inspur has invited IBM employees to jump ship and join their company, as they aim to replace IBM server sales in China. It is hard to estimate the cost of the Federal executive indictment decision to U.S. companies because the value of U.S. digitally deliverable business service revenues from China is all over the place. For example, the U.S. Department of Commerce tabulates U.S. cross border digitally deliverable services to China at $11 billion dollars in 2011. This figure does not square with the $7.8 billion that McKinsey made in China in 2012; the $3.9 billion made by Boston Consulting Group; $5 billion made by IBM in 2012 and the roughly similar figure made by Microsoft. Add to this Cisco, Qualcomm, Oracle, Intel and Google’s Android services; and many other U.S. digital service players in China, and the author roughly estimates $30 billion in annual digitally delivered revenues to U.S. companies. These sales are now in jeopardy. Cisco sales in China dropped 18% in the 1st quarter of 2014. The key to this story is that U.S. foreign policy and national security policy is disconnected from the major U.S. multinational drivers of the U.S. economy in global trade, consumption and investment. IT is among the top sectors of the U.S. economy. Did the President Obama bother to examine and weigh the likely China response to its inflammatory innocuous indictments, since the indicted parties are beyond the reach of U.S. judicial authority? For the sake of a symbolic gesture the U.S. government opened the door to China’s goal of advancing the domestic market share of its own IT companies. The door was already ajar after the consistent refusal by the U.S. government to allow Huawei and ZTE to commercially compete in the U.S. market. There was bound to be China push back on this matter alone, at the right time. China only had to wait. The U.S. indictments, particularly in the context of the Snowden affair, provided the right time for China to advance its domestic economic agenda to reign in U.S. digital service multinationals and move Chinese IT technology to the world stage. Only the Chinese leadership knows how far they will go to pushback “the eight guardian warriors” – Cisco, IBM, Google, Intel, Qualcomm, Apple, Oracle and Microsoft, which Chinese news services report that the U.S. government use to “infiltrate” Chinese government agencies and enterprises. In view of the substantial Chinese revenue and bottom line profit contribution to these U.S. IT giants, these companies are most likely kicking up a storm in Washington to lay-off of China. U.S. companies lobby government to protect their intellectual capital in China; but they expect this to be done by diplomacy, not humiliating criminal indictments that only backfire on U.S. companies. If U.S .companies operating in China cannot depend on U.S. diplomacy to protect their interests, they will turn to other vehicles of self protection. U.S. government help may not be worth the cost, if it cannot synchronize its interests with the business community. There are numerous defensive deals which U.S. companies can work out with China, irrespective of U.S. foreign and security policy. After all, Pfizer offered to move its legal domicile from the U.S .to UK in its bid to acquire UK’s Astra Zeneca. There may come a time when the national security politics of U.S. foreign policy becomes so aggressive and costly to U.S company profits, that U.S. IT companies seek a safe haven corporate domicile. We are no longer in the 20th Century, when foreign technology could not hold a candle to U.S technology and everybody wanted IBM. In the 21st century China, India and Brazil, not to mention Europe, has the financial and intellectual means to compete and win against the U.S. in sectors of advanced technology which are vital to U.S. economic growth. The rest of the world is already winning in alternative energy, nanotechnology, and optical electronics. Now they are going after the IT business service sector. 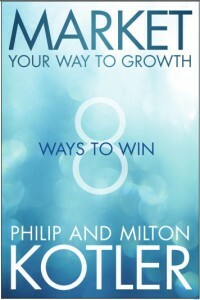 -How did you define the 8 ways of growth? Are those ways applicable for every type of company? Turkey has had a decade of great economic growth, but is now facing a declining period, due in great part to transnational monetary, trade and investment circumstances. She is now roughly in the same distressed condition as the U.S. and European countries, dropping from 8.2 percent GDP growth in 2011 to a current 2.2 percent growth in 2012. Our book Market Your Way to Growth: Eight Ways to Win was written for companies in distressed developed economies, following the 2008 financial crisis. We endeavored to show how companies can grow through smarter marketing, even in difficult times. The book is now very timely for Turkish companies. The book was written for large, midsize and small companies across many different industries. Evidently Turkish companies did some smart things during 2010 and 2011 to grow the country’s GDP. But declining growth in 2012 and 2013 does not look good. Our book will be useful to the whole range of companies in Turkey as the global economy declines and a measure of indigenous social disorder sets in. -How do you evaluate current business environment in terms of growth opportunities? What are the biggest growth challenges that companies are facing today? Turkey has a growing consumer middle class with a per capita GNI of roughly $10.000. This means that there is opportunity for more internal consumption. So its retail and service sectors has room to grow. But the more important issue is for Turkish Companies to expand export. Europe, you major trading partner, will remain stagnant for a long time. Your growth in export to Russia and CIS is impressive and should continue. There are strong ethnic affinities in CIS for your telecommunications and construction industries. The high upgrade of Turkish Airlines holds great potential for international expansion as a global hub. The strongest world growth is in Asia, Africa and Latin America. I do not know enough about your key export industries to suggest new strategic positions in these regional markets. But reliance on Europe may be a dead end. -Of the 8 ways to grow, which one is the most important for the companies, considering today’s highly competitive business e-nvironment? The Eight Ways to Win are not a rank order of strategic priorities. Companies have to pursue all of these paths. Each Company is in a different competitive circumstance and has its own unique set of strengths with which to move forward. There are strategic priorities for any given Company. Without Company details, we cannot say anything further. -How can companies define the right way of forward growth for themselves? What do you suggest for them, what criteria they should they pay attention to when they choose the right way of growth? The right way forward is a matter for Company management to determine. The key answer to your question is stronger strategic planning, management and operations in your Companies. - Of the 8 ways to grow, which one is the safest and sustainable? Why? Again, this varies for different companies. Safety is not a viable metric, because competitive companies must grow, and growth involves risk. The key is risk analysis, not safety. As for sustainability, this is a public environment precept, not an enterprise concept. If by sustainability you mean consistency of strategic policy that is another matter and it is very important. -Considering the risks, which ways are most risky? What kinds of companies are making growth mistakes because of those risk? The riskiest thing is to run a Company by the seat of your pants, without scientific and skillful management and marketing. Most Companies fail because of bad management. 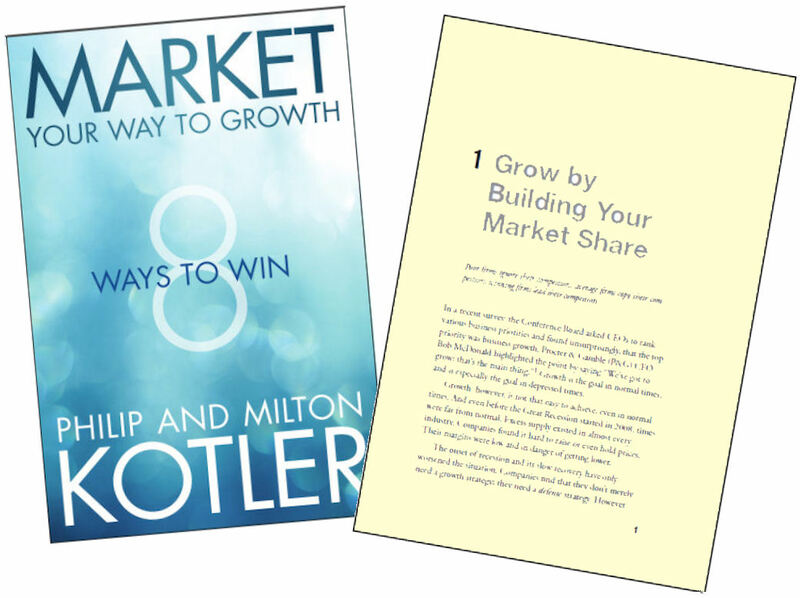 - Gaining market share getting more difficult in today’s competitive business world… What do you suggest to those who want to grow by building their market share? Market share growth depends on competitive advantage in relevant innovation, product quality, promotion, distribution and smart cost reduction for advantageous pricing. -What would like to say about innovation as a growth too? What kind of companies should choose growing by innovating new products, services and experiences? There are all kinds of innovation – in the business model, in product development, in marketing, financing, and in human resources to find and keep the best talent. - Is there enough signs of innovation thinking in Turkish companies? Is this a promising pathway to grow? We do not know enough about Turkish companies to answer this question. If there is important innovation, it should be better publicized so that the global business community knows about this. It has not come to our attention. -How profitable would it be to work with government on public/private enterprises as a growth strategy in today’s business environment? There is a great surge of public infrastructure throughout the world. Turkey has a strong construction industry and should find better ways to compete for public projects. What are your strongest niches in infrastructure construction? Advance these niche successes and build a global reputation. -Growing fast can be serious problem for the companies specially in emerging markets… What do you suggest companies do in order to avoid those kind of problems? Some companies are good at fast growth in both developed and developing countries. Some of China’s state-owned companies in rail, dam and road construction are very fast movers. Malaysia is moving very fast in tourism growth and hospitality. Apple and Samsung are fast movers in consumer mobile communication; Huawei and ZTE are fast in telecommunication equipment. In a competitive world, you have to be fast and smart. -Of the 8 ways to grow, which one is the most criticaly important for the Turkish companies, why? We cannot answer this question. -What is your suggestion for the Turkish companies which want to grow by international expansion? Every large and mid-size company has to expand internationally. We live in a global economy. Find the best fit of new international markets to your company’s strength. 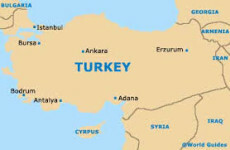 -How can expanding overseas help Turkish companies? You should read Brand Breakout! How Emerging Market Brands Will Go Global, by Nirmalya Kumar and Jan-Benedict E.M Steenkamp. They do a fine job of documenting and explaining the new MNCs of China, India, Brazil and other emerging economies. Turkey has to find its way to enter the class of emerging economies, like BRIC, that world business and thought leaders are paying attention to. -Do you know any Turkish companies that are growing very strongly? Our only addition to Hilton’s comment is that Turkey and its top companies are not getting the message across. Turkey is still regarded as a hub of non-Turkish MNCs, rather than as a generator of its own new global MNCs. South Africa gets more attention than Turkey in this respect. Why? -What are the companies that are very successful at growing right now all over the world especially could you please share with us examples from emerging countries? What are their secret? What makes them successful? I think we answered this question. -How can it be possible growing by building on outstanding reputation for social responsibility? Could you please explain us by given some successful company examples? You have to read Philip Kotler’s Good Works. It is the best book on corporate social responsibility. -What are the most deadly mistakes that companies make during they grow? Every mistake carries a bit of poison. There are as many mistakes a Company can make as there are poisons. Enough mistakes or certain combinations of mistakes will kill a Company. 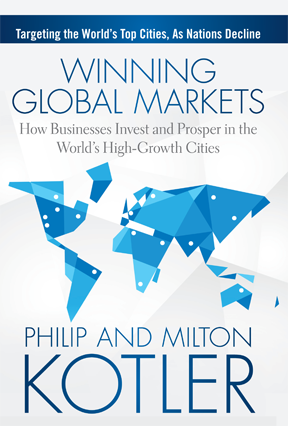 Follow Philip Kotler's latest global activities and discussions. Click here. Milton Kotler writes articles for the China business press. Click here to see the latest. Meet Dr. Philip Kotler in person. Check here for the latest updates on Dr. Kotler's speaking engagements. June, 2013 Milton Kotler led a delegation of major China real estate development companies to visit leading U.S. senior living facilities. Senior living for continuing care is a new and important sector of real estate development in China. The developers are seeking leading senior living brands.